Pardon us for the vanity here, but like any proud parent we couldn’t help but to brag about our own. 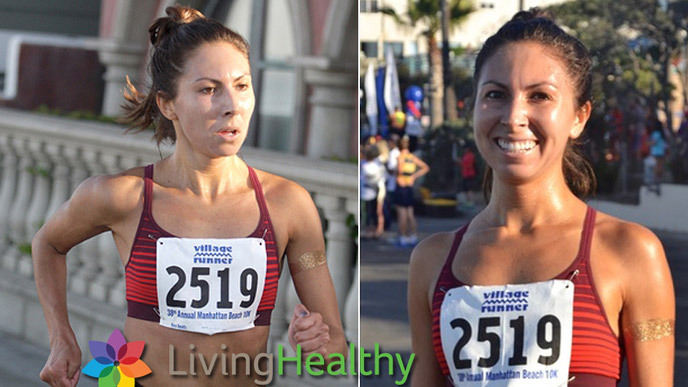 LivingHealthy’s Christine Bolf (our stellar financial controller) took first place amongst the 1,317 female runners in a 10k in Manhattan Beach, Calif. on Saturday. Why is this such a big deal? Well for starters, she ran a time of only 37:23. But also, despite the fact that the 31-year-old took a break from competitively running the past three years (she was an All-American distance runner at the University of Colorado 10 years ago before moving on to the professional circuit), she won the race after training for only three weeks. We’re also scratching our heads wondering how she did it. Especially considering she manages the accounting department full-time and endures long daily commutes (although Bolf has been spotted taking lunchtime runs). Oh, and not to mention, Bolf also broke her personal record from years prior. She also acknowledges the power of positive thinking. Because she wasn’t expecting to win—rather to just gauge her current fitness levels—she was a little thrown off when she realized she was in the lead, so she turned to her inner dialogue to keep her from tripping up. “It freaked me out at first when I was winning, I didn’t feel comfortable,” said Bolf. "But it was the positive affirmations I continually thought to myself that kept me going." Affirmations such as "You’re fit. You’re healthy. Why not you?" And as for the rest of us who might want to take up distance running (and maybe win a few while we are at), why not us? Here are Bolf’s tips below, some that she tried for the first time in her three-week training period. Incorporate strength training into your fitness regimen. Something Bolf hadn’t done in the past, and this time around she felt stronger overall. Do a long run the week before the race (8-12 miles). Bolf says it helped her endurance. Don’t look behind you when you are racing. It can psych you out. Listen to the crowd's cheering instead. Encourage yourself. Give yourself pep talks while running. “Every time that I doubted myself I forced myself to think, ‘wait you got this. You’re in better shape,’” said Bolf. Ah the glory of comebacks as we get older, and this is just the beginning for Bolf. She has her eye on an upcoming half marathon where she hopes to break yet another personal record. Now, please excuse this brief pause as we pop the celebratory champers.